This is a painting I did with the hope of it being juried into the "Happy Hour" show at the Great Hang Ups Gallery. But the show was just the impetus to get it done. I'd been planning this painting for a couple months. It's from a photo I took earlier this summer up at our old farmhouse in New Brunswick, Canada. My two sisters were both up there with me, and we were getting ready for dinner. We had bought two bottles of wine, and it was that golden hour when the last light of the afternoon is streaming through the kitchen window over the sink. 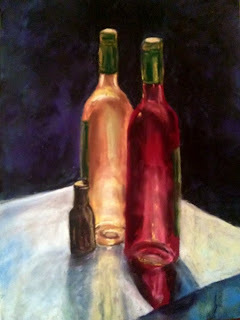 The light poured in, hitting the wine bottles with such a glow, that I had to take a photo. And once I took a photo I knew I had to try to paint it, to see if there was anyway I could try to capture that rich glowing light. This is 12x16, and done on Wallis Belgian Mist. I still love Art Spectrum, but I'm enjoying working bigger than the 9x12 size I usually do with the Art Spectrum. The only problem I have with their paper is that it seems to come in only two sizes, Too Big, and Too Small. The Wallis comes in a 12x18 pad, and it does hurt a bit to cut off that expensive two inches on the bottom. But the 12x16 fits so nicely into the frames I have.